GlycoBac LLC’s efforts to create novel, insect cell-based platforms for drug manufacturing continue to be rewarded. The company, a business spun out of academic research performed at the University of Wyoming, will receive a two-year, $939,580 National Institutes of Health (NIH) SBIR Phase II grant award. This newest grant, which begins Sept. 1, is an extension of a previous Phase I award worth nearly $600,000. GlycoBac’s current efforts are focused on developing new manufacturing platforms for a variety of drugs. The drugs include a novel Zika virus vaccine candidate to be tested in collaborative pre-clinical studies; other mosquito-transmitted (Dengue, West Nile and Chikungunya) viral vaccine candidates being tested in pre-clinical/moving to Phase I clinical studies; and a drug likely to reduce the risk of certain types of strokes, also being tested in pre-clinical/possibly moving to Phase I clinical studies. 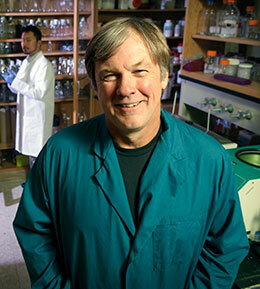 Jarvis says GlycoBac’s grant support has benefited UW by contributing direct and indirect costs through subcontracts to the university; service fees for office and lab space occupied by GlycoBac at the Wyoming Technology Business Center and in another location on campus; and annual minimum royalty fees. The university also has equity in the company. Students have benefited from open access to technical and intellectual capacity within the company. Graduate and undergraduate students in the academic labs in the Department of Molecular Biology routinely interact with GlycoBac staff, and one UW postdoctoral researcher serves as a paid consultant to the company. GlycoBac is the only biotechnology company of its kind in Wyoming and currently provides three new high-paying, full-time jobs for highly trained professionals. For the past 30 years, including more than 18 at UW, Jarvis’s basic research has focused on developing an insect virus/insect cell system for recombinant protein production. Jarvis spun out GlycoBac in June 2011 after his student, Christoph Geisler, won UW’s John P. Ellbogen $30k Entrepreneurship Competition. Underpinning GlycoBac are a number of patents, which the Wyoming Research Products Center (WRPC), working with Jarvis, secured to protect this valuable intellectual property. WRPC is located at UW. The $12,500 award from that competition was used to establish the company and, since then, Jarvis and Geisler, who is now GlycoBac’s chief research scientist, have submitted seven Small Business Innovation Research proposals to the NIH. Including the latest award, five have been funded. Jarvis says four of GlycoBac’s grant submission efforts have been supported by Phase 0 Awards from the Wyoming SBIR/STTR Initiative (WSSI). Jarvis adds that Davona Douglass, WRPC director, has worked hard to seek and obtain patent protection for inventions from the academic lab, which provided the initial intellectual basis for GlycoBac’s commercialization efforts.